Its banks are being increasingly propped up by the U.S. The Christmas and New Year's break, when Europe shuts down and stops thinking, is now well and truly over, and we are reawakening to the same old problems: Greece, Spain, Cyprus, Portugal, Italy, France…all with their hands out for money from Germany, Holland, Finland, and Austria. The holiday from the banking crisis, which was the result of the determination of the ECB to put a lid on it, is also over, with yields on the supplicant countries’ debt rising again. However, joining the bad news list is the United Kingdom. Ominously, the pound is sliding in the foreign exchange markets, providing a very tricky background for Chancellor Osborne’s budget on March 20th. I shall examine the UK’s position later, but first let’s update ourselves on developments in the Eurozone. The reality is that all the problems of the Eurozone are still with us, despite the fall in bond yields and their modest subsequent recovery. There is now the likelihood that we are about to enter the final phase of the end of the Eurozone experiment, with far wider consequences. So we need to pick up the story where we left off. As we can see, government deficits for these countries took off from the time of the banking crisis and are still increasing beyond the charts’ cut-off point into 2012. They reflect poor economic performance, a lack of desire to slash government spending, and contracting bank credit. Only Spain and France were below Carmen Reinhart and Ken Rogoff’s tipping point of 90% government debt-to-GDP (see their book, This Time is Different), but in Spain’s case for 2012, if you add in €27bn raised to pay the backlog of bills incurred by regional governments and the €40bn so far (and rising) to bail out the mortgage banks, today Spain is closer to 100% debt to GDP, and France’s is now over 90%. This is a deflating credit bubble. Italy, France, and Ireland have seen the largest withdrawals. Italy has been pursuing aggressive tax collection, driving wealth abroad and deterring economic activity, Ireland has seen a contraction in its financial centre, but France is the surprise suggesting that deflationary forces are stronger than generally understood. 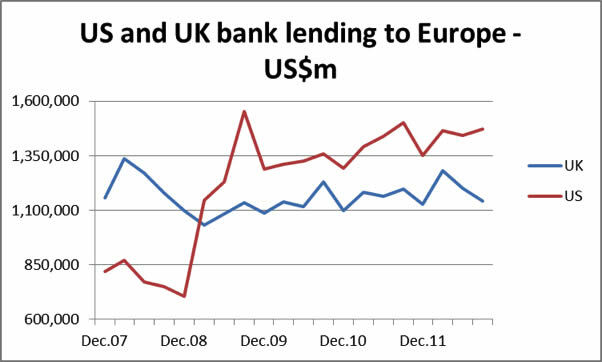 The decline in bank lending from European banks has been compensated for by generous Americans, presumably too-big-to-fail banks on instruction from the Fed, putting up an extra $850bn in the first three quarters of 2009. 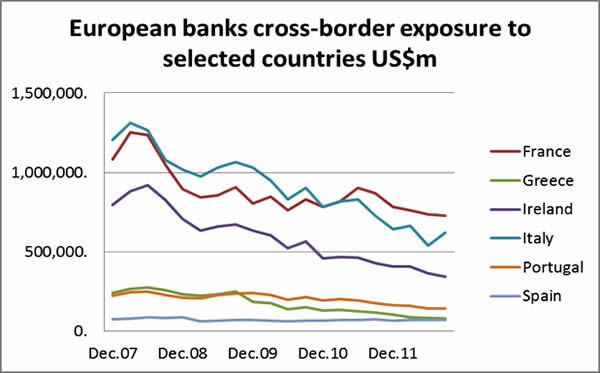 Meanwhile, UK banks have maintained business as usual, slightly increasing their exposure from 2009 onwards. This is shown in the next chart. 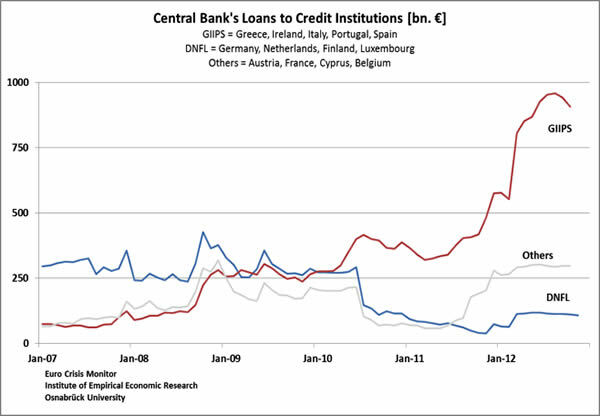 Of course, domestic bank lending in all of these countries, with the possible exception of France, has equally been constrained by capital flight from domestic banks, reflected in TARGET2 balances building up in Germany, Netherlands, Luxembourg, and Finland, as shown in the next chart. This capital flight has come from the other countries on this chart, and interestingly, there is early evidence that money is now leaving France. We can clearly see the effect of last year’s crisis on the GIIPS banks, but there is also a worrying pick-up in France, which makes up the bulk of “others”. This quick tour of European statistics sets the scene. It is clear that some short-term stability has returned, but there is not enough evidence that the underlying position has actually changed. One should bear in mind that European politicians and their economic advisers, with very few exceptions, do not understand markets, and believe that they mostly require confidence. While there is some short-term truth in this belief as recent market performance suggests, the European political establishment appears to go further, believing that confidence is everything. The current economic strategy is therefore little more substantive than to talk markets up. The reality behind this short-term façade is very different. As time marches on, government employees have to be paid and welfare distributed. Those combined government deficits for the Eurozone need feeding by extra taxes and borrowing at the rate of $40bn per month and rising. And this is only part of the story; along with as central governments, regional governments, cities, and towns (particularly in the periphery) are in deep trouble and have even suspended salaries for employees such as doctors and teachers, as well as payments for essential services. General government in the Eurozone (which for statistical purposes includes regional and local governments) takes up approximately 50% of GDP. This is the Eurozone’s weakness: The productive capacity of its economy is overwhelmed by the burden of too much government. 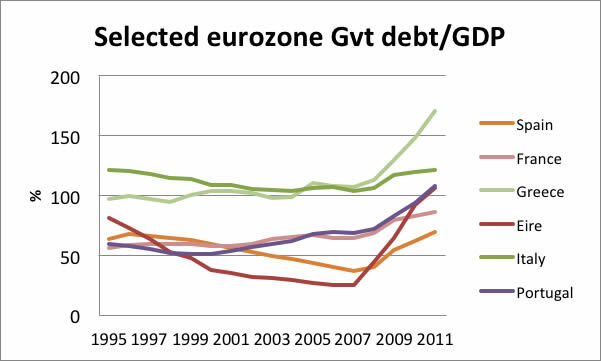 Now go back to the first chart, showing the trend of government-debt-to-GDP for selected countries, and worry. It is indicative not only of the suffocating burden of government debt, but because government dominates individual economies, it is also tells us that their private sectors cannot backstop this debt through future taxes. Therefore there’s no way economic recovery will provide the get-out-of-jail card for the weaker group of countries. The transfer of wealth from a relatively limited private sector to high-spending governments is no solution, as France has found out. If you raise taxes to balance the books, taxpayers walk. No one in Europe mentions escalating welfare costs. So far as I am aware, there are no estimates for the net present value of future welfare costs for Eurozone countries, such as the one by Professor Kotlikoff of Boston University for the United States. The element of “baby-boomers” in European demographics varies, but the state pensions, healthcare costs, and other benefits are very high, as shown in the following table (data mostly supplied by the OECD “Pensions at a glance 2011”). Over the last year, pension costs as a proportion of GDP will have risen above these figures due to the increasing retirement rate, and even more sharply in those countries where GDP has fallen. These figures will therefore be under-estimates for the current position. We know from Professor Kotlikoff’s estimates that the net present value of the US’s future welfare costs rose $11 trillion in 2012, we also know that free healthcare in the eurozone is more advanced – meaning more expensive - than in the US. With the eurozone’s public pension costs on average nearly twice that of the US, we can see that the baby-boomer and longevity problems faced by the United States are nothing compared with key Eurozone countries. It is also important to note that the cost on government finances of a retiring wage-earner is two-fold: The state loses tax revenue and gains a cost. 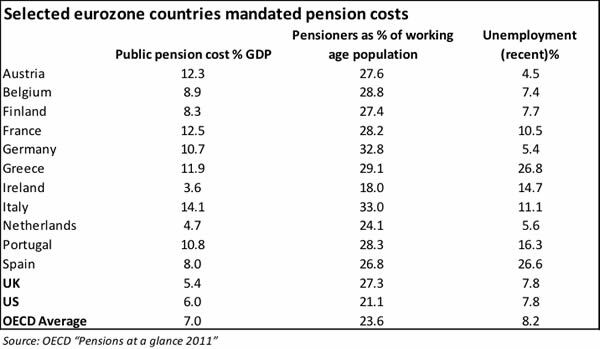 The only Eurozone countries in the table with lower pension costs are Ireland and the Netherlands, both smaller population countries. Furthermore, all Eurozone countries, with the exception of Ireland, have a higher proportion of pensioners than the OECD average, implying again that future welfare costs are substantially greater than those of the U.S. The level of unemployment (the last column) must be taken into account as well, because an unemployed person does not pay the taxes to fund pensions. The countries with a high level of unemployment and higher-than-average numbers of pensioners as a proportion of the working population are in deep trouble. 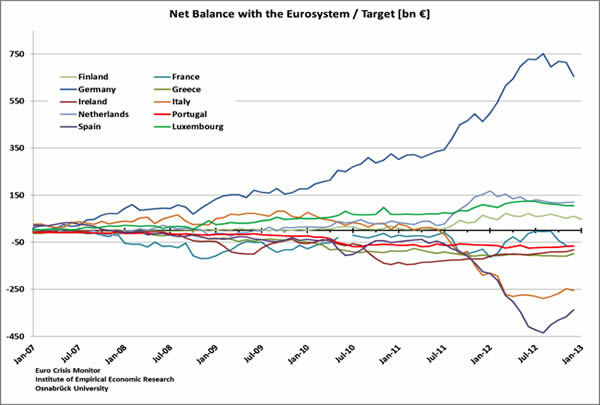 The worst, in descending order, are Greece, Italy, Spain, Portugal, and France. Furthermore, Spain, and Ireland have raided their public pension funds to support general government finances. We can therefore conclude that even if somehow the Eurozone extracts itself from its current difficulties it will have to address the burden of these future welfare costs as a matter of urgency. While on the subject of welfare and pensions, it is worth mentioning the impact on Scandinavian countries with their exceptionally high taxes, which vary from Norway’s 57.9% of GDP to Sweden’s 51.4%. These countries, which everyone assumes are financially stable, will be badly hit by the demographic time-bomb. So far, welfare has not been a headline issue anywhere and until fairly recently politicians have stayed off the subject. However, it is now being recognised as a growing problem to which there is no easy solution. Properly accounted for with reasonable provisions made, it is obvious that including the net present value of these future commitments true government deficits are multiples higher than officially stated. The political balance has changed substantially over the last year, from the cosy days when Merkel met Sarkozy and Monti kept the Italians in order. First, Sarkozy was dumped by the French electorate, which preferred welfare to austerity, and now Monti has been dumped for similar reasons. The idea that Chancellor Merkel can trade greater fiscal control over the Eurozone debtors for her own electoral support in Germany has been disproved. The ramifications of the hung Parliament in Rome are likely to be profound, not least in Berlin. Germany faces full elections in September this year, and it will be difficult for Chancellor Merkel to win, given that her party, the Christian Democrats, did badly in the local German elections in January. The German voter has generally been more concerned with Germany’s relative economic success, bringing low unemployment, than the intractable problem of supporting other Eurozone nations. This may be changing, with Germany’s more dynamic export markets – China, Russia, and the other emerging economies – slowing somewhat. If this trend continues and unemployment rises, the Christian Democrats will find it a struggle to get re-elected. For this reason, it is likely that Merkel’s room for manoeuvre will be increasingly limited. It is apparent to the German voter that the government has no prospect of recovering money lent to the Eurozone periphery through the banks, reflected in TARGET2 balances, nor directly through the European Stability Mechanism (ESM). So far, the ESM has only lent €40bn to Spain to recapitalise the Spanish mortgage banks, but the demands on the ESM are bound to increase. Germany’s contribution to date is €21.72bn, which can be increased, if required, to €190bn. Given Merkel’s political difficulties, she is likely to be slow to subscribe Germany’s full commitment and can use the excuse that she can only be expected to match the other large contributors – who are by the way, France, Italy, and Spain. It is likely to be a political virtue for her to take a tougher line. It would therefore be a mistake to think that Germany is going to continue to fund profligate governments. Since the ECB has already created the precedent (quote from Mr Draghi: “Whatever it takes”), the ECB will have to end up creating the money required. In Part II - Europe: Welcome to the Domino Effect, we conclude therefore that the Eurozone is now on track for a hyper-inflationary outcome, rather than a deflationary collapse, similar to prospects for the other major currencies. Its collective banking system is also extremely vulnerable to shocks with accumulated bad debts from prior bubbles and prospective bad debts from insolvent government debts. To understand how this will play out, one needs to understand the likely future in store for each of the most unfluential, unstable players in this unfolding melodrama: Spain, Italy, France – and a recent addition, the UK. This and the next chart are reproduced with kind permission from the Institute of Empirical Economic Research, Osnabruck University. It has been obvious enough for quite some time at the macro level that the planetary behemoths, whether they be sovereign governments or multinational corporations, are heading for a major fall. As has been said many times on this site, debts that can't be paid back will not be. I have not heard anyboby here advocating purchasing or holding sovereign bonds let alone jumping into the stock market for a very long time. The underlying infrastructure in Europe may leave it a lot closer to the exits though than we are here in the USA. Much maligned unions have managed to keep industrial production within European boarders to some extent, particularly in Germany. I am in agreement with Paul Craig Roberts premise that the most destructive force in the American economy has been the offshoring of jobs, which from the perspective of modern industrial prodcution was a necessity because we still seem to serve the god of "efficiency". The much maligned and subsidized French farms may be their saving grace. We in the US pay less for our food and the most for our healthcare than any other nation on earth. I don't think that that relationship is accidental, but causations of this type are nearly always missed in fragmented and economically focused analysis. Large scale industrial systems are at the foundation of the colapse, whether you are talking about sovereign debt or the stock price of Peugot. Economies of scale, which should rightly be called economies of destruction, have first been subsidized by cheap energy and healthy ecosystems, then by a complex of governmental policies and subsidies, and finally by plummeting wages are finally wrecking the global economy. Loss of purchasing power in a society as a whole will always collapse an economy. All the central banking shenanigans will never solve this problem nor will any other monetary policy. Systems that work that work in cooperation and in concert with natural systems are by their very nature more efficient than their industrial counterparts. Cultures that have had the sense to protect their hertitage from the temporary and apparent efficiencies of industrial systems that are now evaporating because there is no longer anyplace to externalize their true costs are closer to safe exits. Cultures that went for short term profits and gains will be spending a lot more time picking through their economic wreckage trying to build a sustainable economies. "the most destructive force in the American economy has been the offshoring of jobs, which from the perspective of modern industrial prodcution was a necessity because we still seem to serve the god of "efficiency". Treebeard, I would say the most destructive force is the sacrificing of our collective soul for efficiency. Efficiency, technology, science, these are our new messiahs. Strip them to their core and you find the eternal fear of death. I would say the most destructive force is the sacrificing of our collective soul for efficiency. Efficiency, technology, science, these are our new messiahs. Strip them to their core and you find the eternal fear of death. I somewhat agree. The problem with efficiency improvements, which purportedly boost GDP (so we're taught), is that they throw people out of work. Therefore, in order to keep unemployment low, the economy must then create additional jobs, to basically "do more things" than before. However, due to physical limitations on the resources needed to power the economy (the Laws of Conservation of Energy and Mass, the 2nd Law of Thermodynamics), "doing more things" directly correlates with consuming more natural resources. Since we seem to be at Peak Resources right now, it is not possible to grow the economy. Therefore, unemployment must go up. Either that, or the government must expand and employ more people, which of course we are seeing to some extent, though not nearly as much in the US as many would proclaim (it's gone from a 30-year steady 35% of GDP pre-2008, then jumped to 43% post-2008 as a response to prevent the dreaded deflationary collapse from the private sector banking crisis which was then shifted, socialized, onto the people's "sovereign" balance sheets). If one assumes that only the private sector is "productive", while government is a drain of productive resources, then it follows that government spending could increase as a proportion of GDP to the same degree as the improvements in private sector efficiency. For example, if on-farm labour productivity has hypothetically improved say 10X over the last 50 years (in terms of Calories produced per hour of human labour input), or robots have displaced half the workers in a factory, and overall this results in a doubling of the overall economy's per-hour labour productivity, then presumably the government could double in proportion and we'd enjoy the same "prosperity". However, I disagree with the assertion in the article that government spending is not productive while that of the private sector is. I challenge anyone here who disagrees to explain what exactly the "productive capacity of the economy" actually is. Explain your assumptions, go back to the first step, to the resources extracted from the natural world, and follow them through the economy to show how these are transformed into goods and services we buy; and then, using supply and demand dynamics, explain why only the private sector is productive. I predict that no one here will be able to do that. Believe me, at work we are dealing with some pretty unbelievable private sector bureaucracy, something that would rival the worst of any government. But we do indeed need to strive for some degree of efficiency, since we have overshot the carrying capacity of the planet 5 fold. Without 1) technology, and 2) external energy inputs, which currently come from fossil fuels, the world would literally starve and we'd be brought back to a few hundred million (food basically comes from fossil fuels). So while it would be nice to revert to a romantic agrarian existence devoid of high tech gadgetry, it just won't work with 7 billion people. It's too late for that. I do, however, disagree with the assertion that science is our new messiah. If anything, science is dying because it's saying things people don't want to hear -- that the future is not bright, and that we better make drastic changes today or else. Of course, the majority, including our leadership, don't want to hear this, which is why science is being actively shunned. Here in Canada our Conservative government has been engaging in a blatant budget slashing exercise to destroy its scientific departments since they tend to say things that would contradict the message being promoted by our ruling theocracy. A few years ago our government scientists were muzzled and can no longer publicly speak about the issue of climate change. Science is merely a way of looking at the world, of basically formulating hypotheses to explain some portion of how the world works, and then testing them. If a hypothesis cannot be disproven, then it becomes a scientific theory. This differs with economics, however, which is not in any way a "science", as they like to flatter themselves with. Economics does not engage in any kind of hypothesis testing (nor could it to any significant extent given that it's our societies that would be the test subjects). Unfortunately, however, the average person does not understand this shortcoming of economics and casually lumps scientists together with academic economists. I predict some real problems coming down the horizon since when the economy collapses and everyone rejects the academics, by default they will also shun scientific academics, at a time when, more than ever in our entire history, we will need science. Thank you for your post. I don't disagree with any of your post (especially on the government), except for the messiah. I didn't say we didn't need science or technology, although the Neolithic era was our most peaceful era. The question is where does your faith lie? it's saying things people don't want to hear -- that the future is not bright, and that we better make drastic changes today or else. I think, first off, there are a number of political, societal and social movements in conflict here, I would not define climate change and resource depletion as purely a science vs. nonscience debate. A small set of powerful financial interests, without any particular set of values, are using whatever ideologies that are at hand to serve their political and financial ends. They are using both "scientific" and "religious" arguments that are specious from both points of view. If anything, the debate has increased an interest in scientific theory and knowledge particularly as it relates to climate science. Science is merely a way of looking at the world, of basically formulating hypotheses to explain some portion of how the world works, and then testing them. If a hypothesis cannot be disproven, then it becomes a scientific theory. The picture is much more complicated than this. Science is both a body of knowledge as well as methodology for revising and increasing that knowledge. That body of knowledge has evolved over some four hundred years now and has been influenced by competing ideologies, political and philosophical thinking in the historical past. Through most of the evolution of scientific thought, a Newtonian mechanistic world view has held its sway. While revolutionary for its time, Newtonian thinking has ossified over time. Modern physics has gone a long way toward pushing those boundries forward, but the old mechanistic and materialist view still dominates scientific thought even thought there is no longer any scientific basis for it. If science is dying, it is because it has not stayed true to its own values and has let itself be weighted down by the inertia of its own history. That research that does not support a hard determinism, tends to get defunded and rejected. In addition, scientific research now has additional pressure to provide patentable outcomes, as a result research that empowers the individual and not provide profits for pharmaceuticals also tend to get rejected. As an example we still have the mythology floating around of the nucleus functioning as the "brain" of the cell that drives daily cell and bodily functions. The reality is that the nucleus of cell can be removed and the cell can function normally for months while if portions of the membrane are removed, the cell dies instantly. The nucleus is certianly critical for the long term cell function and cell structure repair but it is not responsible for the daily cell functioning and vitality like the membrane. The implications of this information are that life style choices such as diet, exercise and state of mind which directly impact body chemistry and the cell membrane function have much more to do with our health and well being than our genetic make for most people. Yet all we seem to hear on a daily basis is the disempowering determinism about the human genome project. The sins of "science" can be as much that of omission as commission, but they are often both. The guy doing this research had to leave a tenured teaching possition because his research took him into territory that was in confict with scientific orthodoxy. The point is that you can not accept blindly all information coming out of scientific community as truth and club those in disagreement with the scientific method telling them they are irrational. An institutionalized body of information that has evolved over hundreds of years developes its own constituent and institutional basis and resists change. In regards to the "green revolution" being a necessary evil to supply the world with food, that has largely been discredited. There is more biodiversity in a New York City sidewalk than an Iowa corn field. We have created massive dead zones across our farmlands to support monocultures that are destroying our soils, environment, and local farm communities. Natural biological systems relentlessly try to return to states of diversity, balance and health while we in turn resort to more and more extreme measures to sustain our monocultures. The primary reason for genetic modification is make plants "round up ready" so they can be dosed with herbicides and survive. As a result, all the normal biological processes in the soil that normally biologically sustain soil fertility have been destroyed. Now we are committed to using deminishing nonrenewable fossile fuels at increasing costs, not only to kill all life forms in the fields except for the monoculture, but also completely provide for the plants nutrient requirements. Not only is this completely unsustainable at all levels, it is insane. We have turned our farm lands into oil fields and it is making us physically sick. Round up resistant weeds are now showing up in multiple states, what new level of toxicity will we need to employ to control natural systems response to return to diversity and health? Farming systems that use natural processes to do the work of maintaining soil fertility and diversity are more stable and far more productive, both from a calories per acre and net energy in to out. They require far fewer inputs, are less effected by weather extremes and build local communties and fertility rather than mine soil and soil fertility. We need real unbiased scientific research to aid these pioneers rather than the constant attacks of the scientific orthodox community and their nonscientific historically ossified determinist mind set. We are discovering at all levels that we are as individuals are empowered to change the world, through the amazing level of information that is now afforded us. We must reject orthodoxy no matter what flag it flies under. The old boundries of left/right, scientific/religeous, global/local are being blow away and we must use every bit of intuition, intelegence and perseverance to seek the truth where every it is to be found. I'm sorry I had to cut my post short last time, busy time of year. You make a lot of good points and Treebeard's follow up on science is great (I still have yet to find a post of his I disagree with). I'm certainly not in the camp that everything private is better, and I've read plenty of posts from others that are also open to many different viewpoints. Kelvinator wrote a really good post on another thread to the same effect. I'm sure there are some here that see governments as evil, but what I really sense from reading posts on this site is that people are fed up with the structural corruption that exists in both sectors. The two sectors seem to have joined forces to maintain the status quo. It does seem that there are two levels of government, one that takes care of the day to day logistical functions of our society, and the other that works its backroom deals. The U.S. government spending in the past has absolutely boosted productivity and increased unit labor cost at times when it was desperately needed. Speaking of unitl labor cost, it is ironic that there is this belief that austerity or raising taxes can curb our deficits and debt in any meaningful way. Chris M. has pointed this out many times. Growth and/or raising unit labor cost has been the primary reducing mechanism in the past. But as you have pointed out, growth has hit its limits by the constraints of the rising costs of resources, which leaves rising wages as the alternative. But again this goes against the ideology of most free marketeers therefore its not a consideration, at least not in this country. Just look at the stagant wages of the majority in the U.S. in the past 4 decades. Europe is different in regard to the power dynamics of their governments, but not that different. Alasdair seems to dwell on the "welfare," but leaves out what the "other" welfare is. Too many people in the U.S. mislabel things like SS and FICA as welfare. Entitlements are not welfare, so it would be nice if he would clarify what the European definition of welfare is. I agree with you that pure science is pretty much dead, but applied science under (and I stress UNDER) the umbrella of technology (i.e. efficiency and productivity) is more than alive and well. Treebeard puts this matter into context much more critically and elegantly than I ever could. In the "Chris on NPR" thread someone posted he/she would love to see the govt. fund pure science (the individual). What do you think the chances are of that happening? Tax dollars going to a person that may or may not discover something that may or may not be useful? But why couldn't that be an option? It comes back to what we put our faith in. Finally, I also agree that economics is not really a science. Academics began calling it a social science to give it more cache. It really belongs to sociology and psychology. I think once they began to apply mathematical models to it they realized they could create an entire new language. Once you do that you can command more money for your "expertise." Don't get me wrong all sorts of science can be applied and absorbed into economics, but in the end it is a human construct. Thanks again for your post..a lot of food for fodder. If one assumes that only the private sector is "productive", while government is a drain of productive resources, then it follows that government spending could increase as a proportion of GDP to the same degree as the improvements in private sector efficiency. Mark, First off, not all government jobs are merely drains on resources. (I'll discuss it more a few quotes down.) Unlike private enterprise, government has the ability to compel me to purchase its goods and services regardless of my wants or needs. I have but 1 vote to combat those who like a politician's empty promises to do more with less. The populace generally votes for the politician promising a better free lunch and reward politicians for being clever enough to hide the true costs. If I don't like a private enterprise's product, philosophy, prices, location, etc., I don't need to provide patronage. Why should government spending increase simply because private enterprise was clever enough to increase efficiency in meeting the public's needs? For example, if on-farm labour productivity has hypothetically improved say 10X over the last 50 years (in terms of Calories produced per hour of human labour input), or robots have displaced half the workers in a factory, and overall this results in a doubling of the overall economy's per-hour labour productivity, then presumably the government could double in proportion and we'd enjoy the same "prosperity". In order for government to double, taxes would need to be doubled. If taxes were low enough to begin with, your argument makes some sense. If you are in a northern European country where taxes approach or exceed half of GDP, it simply isn't possible. Is it smart to add more government unless totally necessary? I agree that there is bureaucracy in any organization - especially as it gets larger. The number 1 job of any bureaucrat is to maintain the need for the bureaucracy. Unless the bureau is a higher-up's sacred cow, it is constantly justifying its existence, particularly in private where the bottom line can be defined. Government doesn't really have an easily definable bottom line. That muddies the comparisons. So what happens when funding requires a reduction? Generally, on the private side, if the boss doesn't think you are worth your salt, you're gone. So, assuming you've done a proper benefit/cost ratio on each government position, how are you going to remove the dead wood? If the budget is cut, the ones with least seniority go first. Those who provide the least benefit for the cost are likely to be versed in all the regulations that makes it impossible to remove them. The good people see the writing on the wall and look for other opportunities. Those close to retirement, faithful to "the cause," or simply too complacent to find other employment - stay around. Overall, does that increase or decrease benefit/cost? Oh, I forgot to add retirement costs up above. Funny how politicians require any business larger than a few employees to use Generally Accepted Accounting Principles (http://en.wikipedia.org/wiki/GAAP) and exclude their agencies. GAAP requires that the costs are paid as accrued. For example, the benefits portion of the overt costs can be dramatically reduced if the promised retirement (and other benefits) isn't properly charged at the time (just as it is in US government.) Unless you're planning to forego your promised retirement package, include that in the costs. Bottom line: I'll agree that all jobs add value (some negative.) In government, determining the total cost of that value is difficult. It is also exceedingly difficult to remove those providing the least benefit for the cost. In addition, the government can compel citizens to purchase these goods and services regardless of their desires. Politicians have incentive to hide the true costs of these services. Politicians know that voters are more concerned with social issues than economic issues. The costs don't matter until it is too late. I agree that the population has overshot carrying capacity. I think your 5 fold estimate sounds reasonable. Assuming it is, 4 out of 5 people alive need to stop living to achieve sustainability. Will efficiency change these numbers substantially? It's too late for that. Politicians know that voters are more concerned with social issues than economic issues. When the costs become onerous, then voters demand cost reductions. They care more that reductions occur than where they occur. Which profession has more power to stymie politicians than scientists? Unlike private enterprise, government has the ability to compel me to purchase its goods and services regardless of my wants or needs. I have but 1 vote to combat those who like a politician's empty promises to do more with less. One might argue that the private sector is the master at compelling people to purchase its goods and services regardless of wants and needs...and in most cases you don't have even 1 vote to combat it. Why should government spending increase simply because private enterprise was clever enough to increase efficiency in meeting the public's needs? The covert costs aren't quite as easy to quantify - burdens placed on private enterprise to feed unneeded regulatory agencies, costs borne by citizens for not regulating industry enough, costs borne by environment for improper fee assessment, etc. I'm not sure how to quantify the benefits provided. There are just as many covert costs in the private sector - burdens placed on individuals, families, societies, ecology that are too difficult to quantify, and often those costs manifest themselves after the private entity has washed their hands. So, most of these costs have been conveniently factored out of the private sector's bottom-line. The public sector is often left to pick up the pieces and pay for those costs, yet again growing the need for bigger government. Politicians have incentive to hide the true costs of these services. Politicians know that voters are more concerned with social issues than economic issues. The costs don't matter until it is too late. Flip the coin again...the private sector has an incentive to hide the true costs of their products (often employing an army of attorneys to do so). The private sector is more concerned with the economics, and in particular the microeconomics, therefore, the bottom-line. The hidden costs don't matter because they know the public sector will pay for it and/or deal with the fallout. The predicament that CM points out is that we are hitting our growth limits, so all systems that have been based on this model are beginning to fail. The government is not acting as a meaningful counterforce to the private sector, but rather in concert with it to try and save the system that both sectors have created. We have a coin with two heads, no tails. The system now feeds on itself. Government contracts set up by both private (more so) and government (less so) are designed to be self serving and are priced/cost way too high, so yes, these contracts are often a drain on the economy because they are not based in reality, but rather manipulated to keep the power structure in place. This only makes things worse at a time like this. The only tool left in the tool box seems to be printing money, and yet that still won't boost growth because of the limits the world is hitting. Corps. are more than happy to take the cash and sit on it, because the risk and cost of growth is too high. So the PTB that own two headed coin are asking us to make a bet. It may be time to walk away. I'm tired of "all the great ideas" that can be funded with "other people's money." I doubt that politicians have to hide the true cost ... because it is mostly free to the ones who get the benefit. Nonetheless, politicians do lie. They always underestimate - ALWAYS!!! Where is the accountability? If ever questioned, they quickly deflect the question. It doesn't matter because the "American Idol" consumer doesn't know enough to care. If things go as CM is predicting, the yoke that government is attaching to our necks will be increasingly difficult to carry. At some point, it will overpower us. The era of endless growth has ended. When will we wake up to this new reality? What can be done to combat it? Sorry about the property taxes. I understand completely. About 8 years ago, I had my property tax and assessment each rise 300% in one year (it's too long of a story to post). Needless to say, that was the year I became an assessor, and eventually the head assessor in our town. I can relate to the foul mood, my blood pressure still goes up when I think about that year. It would have taxed us out of our home if I hadn't picked up the tax assessor's manual from the town hall, read it cover to cover, and then filed my appeal. I eventually got it knocked down, but it was big lesson learned. I try to keep up with what's going on in our town and remain actively involved. That can help make you feel more empowered. Set up a meeting with your assessors and have them justify the values of your assessment. See what properties they use as comparisons and if they are appropriate. Find out when they did their last collection of data (usually mandated by law... every 9 years in my state). Ask if they have created any new neighborhoods or property classifications (if so, why and how has that impacted tax allocations). Make sure your property record card is accurate and check your neighbors' cards to see if theirs are accurate. Assessments going up is not the real issue, how they are applying those assessments is the issue (i.e. are they town-wide or are they re-assessing portions of the town on a cyclical basis). Even if it's cyclical the data gets fed into the computer that adjusts values across the entire town/city. Sometimes those cyclical assessments throw things off if that section of town has seen dramatic increases or decreases in value...that will shift the percentage allocations of the taxes. It usually balances out over time if the assessors know what they're doing, but you might be surprised. If you have locally elected assessors, they might rely heavily on an outside consultant to set tax rates and collect data. Some outside consultants are better than others, and towns that are strapped for cash often turn to subpar consultants who know how to make the numbers work, but don't really care if the taxes are applied fairly. Things spiral downward from there. That's what happened in my town. Anyway, I wasn't contradicting what you were saying, just pointing out that both public and private are working together and are both to blame. I don't see the line separating the two anymore as CM comments on the fact that it's all a revolving door. I agree I would like to see accountability in both the public and private sector. Too big to fail, too big to jail, etc... it's discouraging. Hope some of the above info helps! I just got my property taxes with this year's increased mill levy tacked onto a generous increase in assessed value. In 11 years, my property taxes have increase by 173%. According to the county, my assessed value increased 26% (over my 2002 evaluation - no changes to the property.) Accounting for the increased basis, the taxes have gone up 117% (more than double - a 7.3% compounded annual increase. ended. When will we wake up to this new reality? What can be done to combat it? California voted in Prop 13 to rein in the government theives. Any chance you can do the same in your state? As I understand it, Proposition 13 was also a good example of the problem with direct democracy: citizens vote on isolated taxation or spending proposals (in this case a tax cut) as opposed to dealing with the government's fiscal situation in general. In the case of California, the Serrano vs. Priest state supreme court decision, followed by Proposition 13, effectively defunded many state schools. After this, the California school system went from one of the best in the U.S. to one of the worst. I realize that this is a complex issue, so I can't say for sure that what I have written is totally correct. On the other hand, Nate, is it necessary or helpful to refer to the state of California as thieves? I agree that California has overspent and overborrowed. On the other hand, many people have become very wealthy in America's largest state, and without the order and institutions that the state government has provided - including many very generous tax subsidies for high tech and other business sectors - those people would not have gotten so rich. I would rather not rein in public education any time soon by de-funding it via measures such as Prop 13, for even if our public schools have some flaws, they are a lot better than having children and teenagers whose parents cannot or will not pay for private schooling wandering the streets or working in sweatshops. If those weary of "government thieves," have their way and gut the public sector, the police, fire fighters and teachers will not have any jobs, and when one drives from San Francisco to LA, the question will become how long until the real thieves stop your car and take your money. Unless of course, you own a software company or big vineyard. Then you'll have private mercenaries escorting you. I know young people from Northern Mexico, Brazil, and Russia where this is the case, and I hope California does not go in that direction. I sympathize with libertarian ideals to some extent, but to call taxation thievery shows a lack of appreciation for what people in countries that are not as able to fund their public institutions must deal with. Back in NY, about 15 years ago. True story. My mother put on a local school board by a coalition of residents who had an issue. Never mind the illegal things (mail tampering., for one) done to her and her fellow new candidates during the campaign(s); she and a majority got in on the second election try. The old guard was out; the new board majority went over the budget as a matter of course. They found ten teachers on the salary schedule that did not exist. And there was annual rent being paid on a nonexistent retaining wall. Where was this money going? When confronted with these questions, the superintendent had a literal stroke and spent the rest of his life in a nursing facility. Every taxpayer got a refund and lower taxes as a result of the new school board's vigilance. Kickbacks for various supplies or service contracts can also be an issue (food for the cafeteria, cleaning supplies, mechanical services, construuction). And salaries for real poistions for real people that exist but are not actually filled (no shows) can also steal taxpayer monies. I urge any of you that have the time to get involved in local politics and be vigilant. Thieves abound. Who will care for the children - perhaps the parents should..
On the other hand, many people have become very wealthy in America's largest state, and without the order and institutions that the state government has provided - including many very generous tax subsidies for high tech and other business sectors - those people would not have gotten so rich. Exactly - thievery. When you steal from others (call it taxes) and use it to hand out subsidies or benefits so some can become rich, what would you call it? California could certainly cut taxes immensely as could nearly all jurisdictions and fund critical items. But the politicians and bureaucrats don't like to have their spending curtailed, so just as the Administration recently outlined the modus operandi in a memo, they cut the most important things first to spite those that want to remove their funding. You kind of missed an important detail in those countries you listed. The politicians nicely disarmed the citizens in those countries leaving it safe for thugs to routinely ambush helpless citizens. Police don't stop crime, they simply clean it up and if lucky catch the perpetrators. So no, I don't believe we need police that make salaries and have exorbitant pensions well above those forced to pay for them. On education, let's see we force massive taxes on peope so we will have a good education system, then we get things like this: 80% of NYC high school grads can't read. So exactly how is all this stolen money making things better. NYC was second in the nation for spending per pupil. The US is near the top in spending per pupil. Still think education should be in the hands of bureaucrats instead of the parents? “Marmet, West Virginia is a town of 1,500 people living in a thin ribbon along the banks of the Kanawha River just be-low Charleston. The town's public library is only open Thursdays, Fridays, and Saturdays. It's housed in a small building the size of a trailer, which the state of West Virginia describes as an "extremely small facility with only one Internet con-nection." Which is why it's such a surprise to learn the Marmet Public Library runs this connection through a $15,000 to $20,000 Cisco 3945 router intended for "mid-size to large deployments," according to Cisco. In an absolutely scathing report (PDF) just released by the state's legislative auditor, West Virginia officials are accused of overspending at least $5 million of federal money on such routers, installed indiscriminately in both large institutions and one-room libraries across the state. The routers were purchased withou t ever asking the state's libraries, cops, and schools what they needed. And when distributed, the expensive routers were passed out without much apparent care. The small town of Clay received seven of them to serve a total population of 491 people... and all seven routers were installed within only .44 miles of each other at a total cost of more than $100,000. In total, $24 million was spent on the routers through a not-very-open bidding process under which non-Cisco router manufacturers such as Juniper and Alcatel-Lucent were not "given notice or any opportunity to bid." We can argue about who the real thieves are - the bottom line is that starving the beast forces fiscal responsibility. The politicians and union negotiated over pay and benefits and settled on a package that promised 8% minimum returns forever. Was an 8% return that unusual in the late '90s? Was the politician able to negotiate lower salaries in return for this promise? That was the go-go decade. I just don't know what occurred. The results certainly kicked the can down the road. The school district puts out a new "learning" levy every 3 years. They hire pollsters to determine the maximum levy that will pass. At least, that is what it looks like because the levy always passes within 0.3% of the required vote. Some levies, it is up a lot and some it is just up. So, once it is broken down to the components, how can I complain without sounding like a snivelling selfish creep? Each year, another gotcha seems to crop up. I'm not willing to do what Wendy's mom did. I'm afraid the can of worms is so entangled that the only solution is Alexander's solution to the Gordian Knot. Until the system fails, there isn't any use in righting it. I don't begrudge public employees. If it weren't for the people filling these positions, others would. It is the politicians spending other people's money and the populace who keep reelecting them that raise my ire. I'm reduced to voting against any and all tax increases. I agree with Nate that starving the beast forces fiscal responsibility. Yeah, I hear you. I posted a while ago about under-rides on the levy limit. They never happen, albeit, unless the town litierally strikes it rich somehow, even then, there would be some justification to keep raising the levy limit. Because of budgetary projections and capital outlays, towns/cities will always take the full increase of the levy limit permitted by law and try for over-rides when they can. And the more money at stake, the worse it gets!! I also agree that the salaries and especially pensions of public employees need to be overhauled. Everyone on this thread who is complaining definitely has a right to be. I also think the big businesses that are in the room dictating how restrictions/requirements are written for government contracts (basically shutting out the little businesses or those who don't have enough money to "play the game") is just as harmful. We often wind up paying 3X what we should for a typical capital expenditure or contract because of the state or local contractual requirements. In this case the thievery is heading back out the door to a few in the private sector who have enough money to massage the public/private system. Nice profit if you're wealthy enough to get it! The entire thing is a big mess! It's why I like living in a small town. A small town employee is more likely to fight for fairness when it is effecting their immediate neighbors and friends. The social distance is not as great. Hey don't forget that just because your house is assessed within 10% of what you think is fair market value, doesn't mean the rest of your town is, and that you're paying your fair share of the tax allocation. That's why my assessment (AND TAX!) went up 300%. They created a new neighborhood, raised all those property assessments within the neighborhood to FMV, but left the majority of the town way below FMV. That placed an unfair (ok, really unfair!) burden on our little neigborhood that year. We were essentially picking up most of the tab for the 2.5 rise in the levy limit. If I didn't get involved I probably would have been stuck paying that rate for quite a few years. So, you might still go to the assessors office and ask them to justify their valuation in relation to assessments in the rest of town. Just a thought, maybe you already have. how do you starve the beast. how do you"go Galt"? The euro nations are drowning for one, very simple reason: They voluntarily surrendered the single most valuable asset any government can have: their Monetary Sovereignty. They are monetarily non-sovereign.. They use the euro, which is not their sovereign currency, so they cannot control their money supply. Unlike Monetarily Sovereign governements (U.S., UK, China, Canada, Japan, Australia et al), monetarily non-sovereign entities (you, me, Chicago, Florida, France, Greece et al) cannot create their sovereign currency, as they have none. So they literally can run out of money. Those who do not understand the differences between Monetary Sovereignty and montary non-sovereignty, do not understand economics. How do you "go Galt"? Reduce (or eliminate) the times money cycles through our system. Grow your own food, make your own adult beverages, reduce (or eliminate) your electric bill, heat with wood, become a handyman instead of hiring it out. The list is long, and following much of what PP advocates will get us closer. Another step is to remove your expertise (or drive or work ethic) from a system that simply uses you as a 'tax donkey'. Chris Martenson dropped out of a very materialistic world that paid him well and transitioned to a lower paying yet much more fulfilling lifestyle. He wins! It's a beautiful day here in California, so I'm back to my garden and pruning the trees. I hope others chime in, because this is a worthwhile topic to pursue. The Sloop "John Galt." It has a catchy ring to it. If Land is a bit out of your range, you are in luck. Yachts are going a dime a dozen. Then you can catch your breakfast. Algae are good healthy eating. (My information is that there are no poisonous algae). That person you took fishing or to the other side of the bay wasn't exactly a fare paying passenger. And that half a sheep was a gift wasn't it? Can't see anything wrong with that. "You need to send a message to your nephew a thousand miles away but the lines are down? I can help, but my batteries are flat and need to be charged. Together we can make it happen." "Is that Saffron you have there amongst the spices? A whole Kilo?" "I like a lot of Saffron on my food." Robert Mugabe stole farm land from people who knew how to farm, and gave it to people who didn't. I'm rather disappointed in your responses. There is an expectation on this site that extraordinary assertions need extraordinary support. I agree that Mugabe stole farm land, but was that his only crime against his people? Am I to assume that had he not stolen farm land, that everything would be okay? Do you really believe that to be the case? What about all the other examples that Davos cited? Everyone knows federal deficit spending causes inflation, and we're right at the tipping point. Well, what will you believe, 60 years of data plus projections based on data -- or intuition? I read through some of your articles, trying to understand your point. I saw "monetary" and "sovereign" many times, but no real explanation of what exactly your theory entails. Would you be so kind as to post a link to a site that explains your theory? The Wikipedia site wasn't too helpful http://en.wikipedia.org/wiki/Monetary_sovereignty. I'm interested in how it works and particularly where it has worked in history. It would also be interesting to see where the regimes that Davos cited went wrong. As flawed as the Fed's CPI calculation is, at least they have data presented in many forms to see how the index has progressed over time. Your link shows year on year changes for federal government debt versus CPI. Since there isn't a correlation between these 2 graphed series, you assume that there isn't any correlation between government debt and inflation. Let's look at a longer time scale to see if any correlation becomes evident. This link just shows the cumulative effects of the inflation index over time: http://research.stlouisfed.org/fred2/series/CPIAUCSL. Note the change in slope that occurred a few years before Nixon closed the gold window in 1971. This link shows the cumulative federal government debt: http://research.stlouisfed.org/fred2/series/GFDEBTN. Sorry that I couldn't find a link at the fed site that contained both these graphs together. It would also be nice to see it on a semi-log scale so that small perturbations at the beginning of the rise become evident. Yes, Zimbabwe is a great authority for you. I suggest you listen to everything Robert Mugabe's bank tells you. And also believe him if he tells you he didn't steal farm land from farmers and give it to people who had no clue about farming, and that didn't cause the collapse of his agrarian economy. He's a great source of information. You've generated quite a bit of heat, but not too much illumination with your posts. To be fair, some of the posts directed at you were less than respectful. Nonetheless, I'd like to continue the conversation on this thread. If your theory has merit, I'd like to know more about it. Right now, I'm not convinced that it is more than a grand deception. I hope you will treat me with as much respect as I give you. Davos was posting outside the rules, and apparently that caused you to abandon our conversation. I promise to be polite, but I intend to render your concept of "Monetary Sovereignty" to its rightful place on the compost pile. Without confidence in the currency, monetary sovereignty is an utterly worthless concept. PS I apologize for misusing the word "respect." Respect is earned, not given. So far, you've done nothing to earn my respect. Politeness is given and reflects on the bestower. Another step is to remove your expertise (or drive or work ethic) from a system that simply uses you as a 'tax donkey'. Grow your own food? Check. Make your own adult beverages? Check. Hey! I've 'Gone Galt' and didn't even know it! Cool! But I'll one-up ya. Produce your own water? Check! Recently drilled a well that produces 55 gallons per minute of liquid Gold. Woo-Hoo!!! And I did it in California too! I'm impressed! I'd love it if you shared some details on the well you drilled. This was definitely one of the most difficult decisions I've ever made. Drilling is very expensive, $2,500 set-up costs and roughly $13 per foot of depth, with no assurance of success. None. Zero. You write a check then hope and pray that you find water. If after drilling a thousand or fifteen hundred feet (whatever your checkbook allows) and don't hit water you have to decide whether to call it quits or throw more money at the problem. I was fortunate; we hit water at 450 feet. I would have been satisfied with 20 to 25 gallons per minute of flow rate, but got 55 gpm. This was crucial for us. Southern California is a desert (well, technically it's a semi-arid environment. In San Diego we average about 12 to 14 inches rainfall per year). Shortly after we started down the path of resiliency I realized that everything was contingent on water. All my gardens and livestock would wither and die in an acute crises where the utilities failed, and a 'slow burn' would make buying water prohibitively expensive (it almost is now). We looked at relocating out of state, but just couldn't pull the trigger. Water was/is the deciding factor. If we would have drilled a duster, I would have attempted to dam up the gulley that runs through my land in order to make a pond that could be used to irrigate. Failing that would have forced us to move or take our chances when TSHTF. Fortunatly we were spared that agonozing decision. All told we spent about $23,000 on the drilling and pump/tank system, but worth every penny ten times over considering how it's changing our lives. This is one of the experiences that has elicited a humbling sense of gratitude for the simple things that most people take for granted, as I have for most of my life. In my younger days, "going galt" was a necessity. I was poor and did everything myself, and I mean everything, wiring, plumbing, construction, car repair, appliance reapair, you name it. Now that I have busted my @#$ my whole life and have a few coins in the bank, I'm still gault just because I have gotten so pissed off at the "system". Though I did hire a company to install hot water panels recently. That was a strange experience, someone else working on my home, I guess wonders never cease. In retrospect, being part of a community would have been a better way to go. I guess I've got a bit of the rambo John Wayne mentality, as much as I hate to admit it. Is that the standard disease of a typical american male? I have picked up a lot of skills along the way, but certainly paid the price. When we go it alone we refuse to be vulnerable and ask for help. When we do it ourselves we deprive other working stiffs the opportinity to make a living and limit the oportunity to make those community connetions in some way that build resilience. Just some thoughts about going it alone. I followed your link with some trepidation. As I clicked, I was wondering how many clicks it would take to get to a website promoting your books. Surprise, surprise! That is your website and you promote your books there. How convenient. I'm going to alert the moderator that you have posted spam. It is a wee bit dressed up, but still it is spam. Your intent is to get clicks to your site, not to provide illumination for this audience. Were you to defend your suppositions on this site, I would accept your site as a resource. Since you occasionally flit over here and excrete such "useful" information, in my opinion, it is simply spam. If Jason restricts your ability to post, send me PMs and I will post them in their entirety. You can bet that I'll have a response. Perhaps with my help, you'll be able to see the errors of your ways.